I am OBSESSED with how this party turned out. The bright colors, the dessert table...just all of it. I had so much fun styling this party for our little guy's birthday and even more fun sharing some of the behind the scenes action in our Instagram stories. 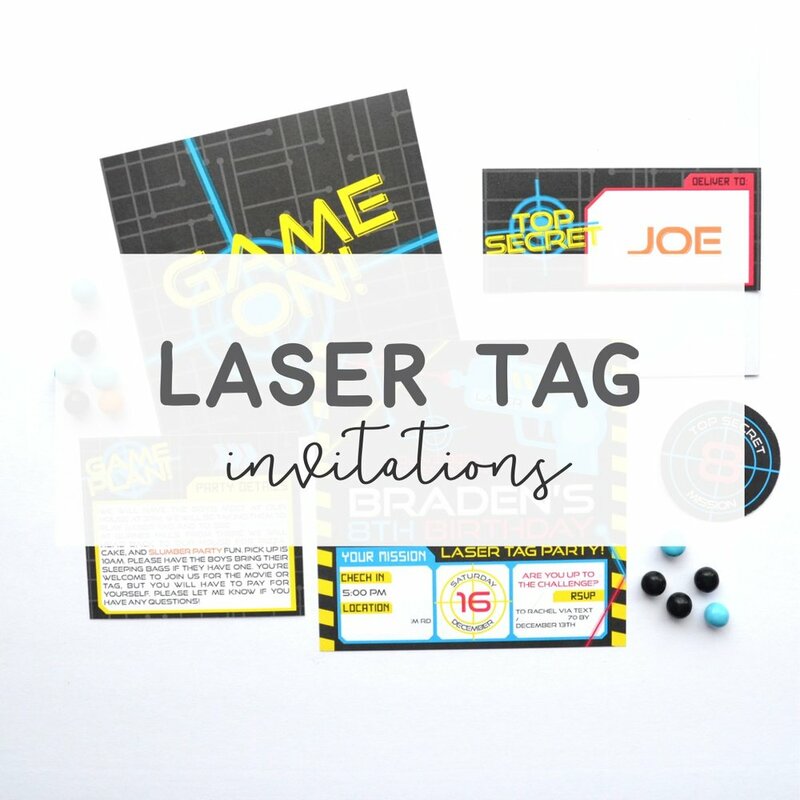 When our son decided he wanted to have a laser tag party, I instantly envisioned having a square invitation with the graphic we used on the back. Since we would be taking the boys to the event and then bringing them back to our house for a sleepover, I knew having a small insert (our 'game plan') for those details would be important as well. I am absolutely loving the stage of life we are in when it comes to our children's parties. Having the 'main action' part of the party outside of our home means a) Less mess (um, YESSSS) and b) I don't have to plan any games or activities - I can just focus all my energy on decorating. Which, let's be honest, is the most fun part! Balloon garlands are most certainly having a moment in the party world, and I knew right away that I wanted to incorporate a large one on our dessert table to really bring a huge pop of color and make a large statement (without a lot of work or money, am I right?!). What helped make this super affordable (and awesome!) were pairing regular balloons from the party store with these amazing marble balloons. Building a dessert table for a sleepover, I typically put the emphasis on snacks (think popcorn, pretzels, etc) with a few sweets thrown in. That way the kids can just grab a snack and carry on with their partying. Here is a small styling tip when it comes to making Twizzlers stand up straight and pretty (as opposed to sad and droopy which is how they come out of the bag as) - wooden skewers. I just shoved a skewer through the center of the candy to make these really shoot of like laser beams. Aren't these colors PERFECT for this set up?! I think this food detail was my favorite of the party. I picked up this small #8 Balloon from Party City, but you can easily find them pretty much anywhere these days! VIP passes are always a hit! Normally I would throw these into lanyards for the kids, but honestly, if you just print them off on card stock, punch a hole, and thread some ribbon through them, I promise you the kids will not care! I tried so hard to find a cute laser set like the ones we used for the centerpieces for under $5 a pop, but in the end I couldn't so I did the next thing I knew the kids would love for the favors - mini pinatas! Filled with candy and topped with a note not to open until they were home ;). I am a huge fan of our candy wrappers. Such an easy thing to include and they really just take ordinary candy and make them totally coordinate with the entire party! Another successful party to celebrate another circle around the sun! These party decorations were so easy to set up, which means you could easily bring them into a place if you are hosting your party at the actual event. I always love to hear - what was your favorite detail about the party? ?